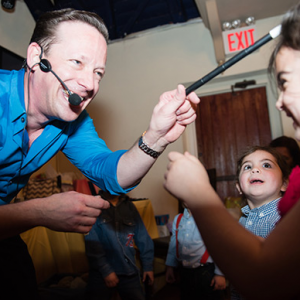 Looking for a Central NJ party entertainer for kids? Hiring a kids’ party entertainer for your children’s party can be a stressful experience. Knowing how to choose the right and best entertainer for your kids can be daunting but here are a few ideas that may help. The goal of hiring a children’s entertainer is to ultimately have a successful children’s party that is safe and fun for your children and their friends. For example, for health and safety reasons, a professional will blow up balloons using a pump and not by mouth. Here are some other tips to help you find a professional party entertainer. Call local kids party entertainers only. If you’re calling a kids’ birthday party entertainer you’ve found on the Internet, ask them where they’re located. If they’re hundreds of miles away, they’ll probably be a “talent agency” middleman company that will subcontract the job to some unknown person who is local to you and this will end up costing you more. Avoid this kind of third party contract. It’s not only cheaper to find the local person yourself but it is also better because you can meet them in person and ask around about their reputation. Word-of-mouth is a very important means for finding good entertainers. Ask other moms and dads, teachers, caregivers, etc., to get their feedback on entertainers they’ve used in the past. Know the entertainer you are hiring. The exact date and time. It can also be handy to ask about cancellation fees or reschedule dates in case something goes amiss. Exactly how many kids you’re expecting to be at the party and their age range. How many kids the entertainment package will cover. The amount of time you want the kids to be entertained for, and whether or not this includes eating time. Ask about the level of variety (for example, face painting, balloons, tricks, stories, etc.) the entertainer can provide; this can be very important for a party of longer duration where the kids can easily grow bored. Any particular preferences for performance ideas, tricks, and so on, that you have in mind. If you don’t have a venue in mind, this is a good opportunity to ask if the entertainer has their own premises or good suggestions. Make a choice based on more than price. Price is not the only indicator to keep in mind when making your selection. While you may be tempted to take the cheapest price, only do so if you’re also guaranteed a high level of professionalism and the entertainer has a good reputation. Does the manner in which they present their company or activities appear professional and polished? Does their advertising material (website, pamphlets, etc.) reveal that they have taken care in putting together what they have to offer? Have they taken the time to add photos or videos of their work and talents? Who is doing the job? Are they sending in an employee? Does the entertainer provide the range of activities and talents you’re after? Does the entertainer provide more than one person when he or she is offering one-to-one activities such as face-painting? If not, how can they keep the remaining children entertained while one child is the focus of their attention? Does the entertainer have any memberships or qualifications that they can show you? For example, does the entertainer belong to a guild of magicians, or a club of children’s entertainers that you can look up? Do they have references from other parents or schools? Do the two of you “click”? The entertainer’s enthusiasm and willingness to be a successful part of your child’s party should be evident to you through their tone of voice, the information they’ve provided, their flexibility to accommodate your wishes, and the extent of agreement to the things you’d like to happen. City, Montclair, Upper Monclair, West Caldwell, Livingston, Essex Falls, Ridgewood, Glen Ridge, Mountain Lakes, Upper Saddle River, Alpine, Hackensack, and more. For more information on booking, please feel free to call us at 732-266-3471, or contact us here.